Sam Sherwood, Mesa AZ, got a bass grand slam catching largemouth, smallmouth and crappie on his trip to the southern end of Lake Powell this week. Bass are starting to spawn and fishing success is picking up. 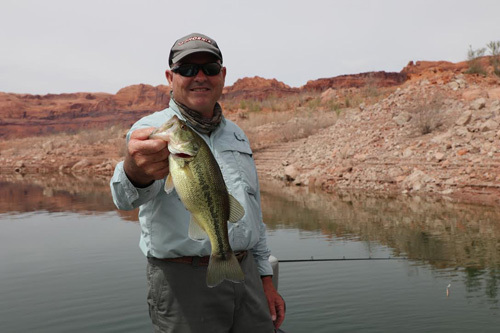 Based on the extreme water clarity found in Lake Powell last week we went further uplake to see what conditions prevailed. Crystal clear water was found in Llewellyn Gulch and Cottonwood Canyon with 25 feet of visibility at the mouth of both canyons. As we went further back in the canyon, water clarity declined to about 15 feet. We then went up the San Juan and found clear water as well but not as extreme as found in main channel canyons. In Piute and Neskahi water clarity was about 15 feet. It is likely that water clarity will decrease as water temperature warms and runoff begins. Right now, fish are more likely to be caught in canyons and location where water clarity is less than 15 feet or if the bait is fished at depths greater than 30 feet. More fish can be caught during early morning and late evening when direct sunlight is blocked by high canyon walls.